Sunday 27 An article under the caption advertisement signed “Mary Adams”, appeared in the “Journal”, of Muscatine, in which Colonel Hill is outragiouly slandered. The col. called me and several other officers to consult us what ought to be done in the matter. 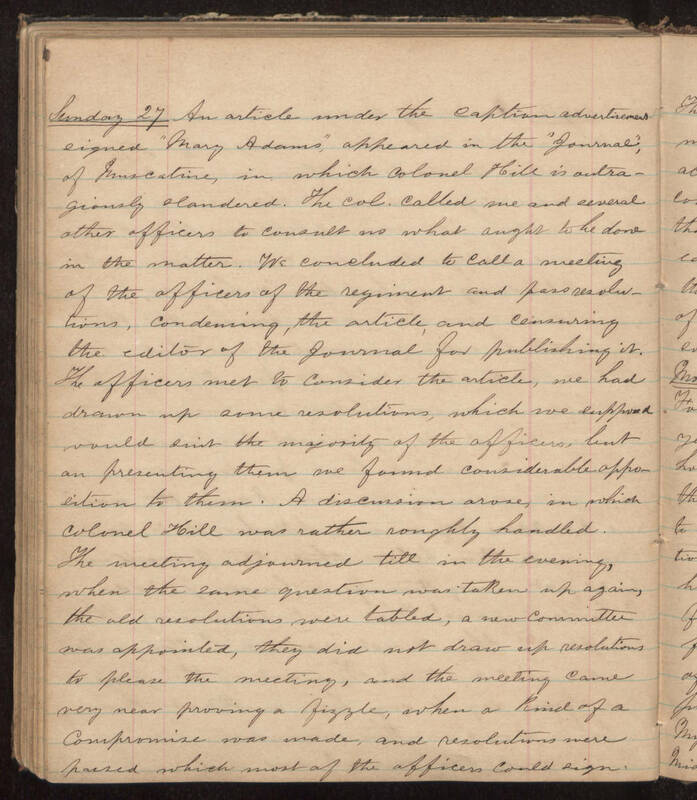 We concluded to call a meeting of the officers of the regiment and pass resolutions, condeming the article, and censuring the editor of the Journal for publishing it. The officers met to consider the article, we had drawn up some resolutions, which we supposed would suit the majority of the officers, but on presenting them we found considerable opposition to them. A discussion arose, in which Colonel Hill was rather roughly handled. The meeting adjourned till in the evening, when the same question was taken up again, the old resolutions were tabled, a new committee was appointed, they did not draw up resolutions to please the meeting , and the meeting came very near proving a fizzle, when a kind of compromise was made,, and resolutions were passed which most of the officers could sign.